What Day Of The Week Is September 1? 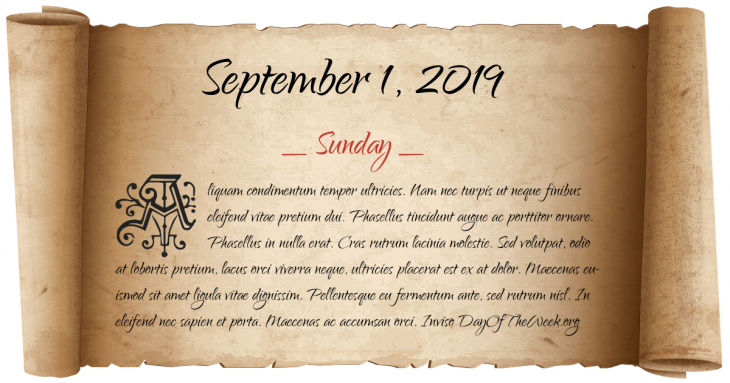 September 1, 2019 is the 244th day of the year 2019 in the Gregorian calendar. There are 121 days remaining until the end of the year. The day of the week is Sunday. King Louis XIV of France dies after a reign of 72 years – the longest of any major European monarch. American Civil War: Battle of Chantilly – Confederate forces attack retreating Union troops in Chantilly, Virginia. The armored cruiser Georgios Averof is commissioned into the Greek Navy. It now serves as a museum ship. George C. Marshall becomes Chief of Staff of the United States Army. Iceland expands its fishing zone, putting it into conflict with the United Kingdom, beginning the Cod Wars. Attempted assassination of King Hussein of Jordan by Palestinian guerrillas, who attacked his motorcade. Who were born on September 1?